Make water walk from one cup to another! 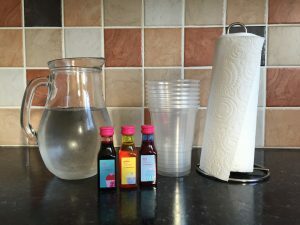 This is a fun and easy children’s science experiment playing with water and colour. Watch the water walk and the colours combine! Place all your cups in a line. Using your jug of water carefully fill every other cup. The cups on the outside do not need to be as full as the ones on the inside. 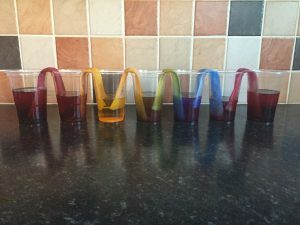 Add a few drops of food colouring to the cups filled with water and stir – These can be any colours you like. Tear off one piece of kitchen towel, fold it in half, then fold it in half again. Bend this kitchen towel so that one end is in one cup, and the other end is in the other cup. Do this for every cup. Leave for approximately two hours and let the magic happen. The water has been absorbed by the kitchen towel and used the towel to get from one cup to another by capillary action. 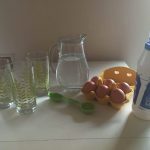 Take a look, what has happened to your empty cups? As this has happened the different colours of mixed so not only has the water walked but it has created some cool colours. 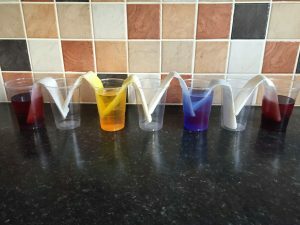 Use different colours and see if you can guess what colours this might create? …Or make a few simple changes to the experiment and see if this makes it harder or easier for the water to walk. Use a thicker or thinner type of kitchen towel, or maybe a different material altogether. Wet the towel before putting into the cup. Replace the water with cooking oil.